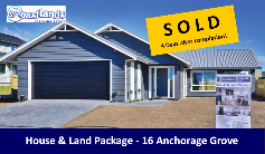 Our past builds have been so popular, they all sold either before completion or within days of completion. We do not have any more house and land packages available as we are looking to retire. We still have a selection of some of the best sections still available. Contact us now to find our more. Development work at Coastlands is completed and all titles are available. The last stages to be developed offer some of the best sections in the subdivision. These stages are close to the beach, with magnificent ocean views. Where possible, all sites have been designed to take advantage of the lovely views without taking away your neighbours view. Height restrictions and a few building platform perimeters apply to some sections. The views available from each site reflect in its value. Generally, the higher the price, the better the view and location to the beach. A good variety of section sizes are also available, with small sites around 550m², some larger sections up to 1052m² and the average size of between 650m² to 750m². 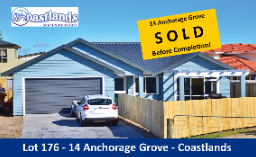 Coastlands is a suburb of Whakatane, so is fully serviced, with excellent water pressure, fully reticulated sewer, power and telephone. It also enjoys all the facilities of the Whakatane urban area such as weekly rubbish collection, postal delivery and Council maintained parks and reserves. Prices are GST inclusive & subject to change without notice. Building Covenants Apply.